Written by Janet Choi on July 23, 2015 . Once upon a time, email marketing was all about email blasts. You’d set up a single message to broadcast to the masses, rinse, and repeat. Now, this “batch-and-blast” method of bulk-sending promotions willy-nilly to any email address you can get a hold of is obsolete. Not only are there technical capabilities to easily segment and target our messages, we’ve developed a smarter understanding of effective email marketing. Despite this, the lingo and attitudes of batch-and-blast haunt the way many people still talk and think about email today. Think about it: “blasting” people with email or employing the ol’ “spray and pray” approach uses the language of violence and recklessness. Marketing isn’t a war but a process of persuasion, getting people on your side rather than assaulting them. 2015 prediction: 73 subscribers will be seriously injured in an "email blast" causing marketers everywhere to rethink their strategies. The supposed collateral damage of batch-and-blast actually harms your email marketing performance. It subtracts rather than builds goodwill, it’s counterproductive to your deliverability, and it’s just not a smart way to work. So what’s the modern, more peaceful, model for how to approach email marketing? The problem with any batch-and-blast mindset is that it inherently disregards the fundamental rule of email marketing to always be relevant. Working on and with scale isn’t an excuse to be indiscriminate. Whether it’s egocentrism or naiveté, the batch-and-blaster’s approach towards relevance is one of one-sided assumption. “Because it’s my message, of course it’s relevant. Take it or leave it,” goes the thinking. Yet that’s the equivalent of building a product that nobody wants. In fact, let’s apply the concept of product/market fit from the general startup world to email marketing. According to Marc Andreessen’s definition, product/market fit is being in a good market with a product that can satisfy that market. That market is made up of people — and when you’ve made something that those people want, that’s what gives you the footing to scale. Think about your messages as your product. Fit is another way to think about relevance that reminds you that the mere existence of a message isn’t enough and you have to think about who’s on the other end of the line. How much have you found out about your audience’s needs and desires in relation to your business? What are you doing to achieve message/market fit? The power of email is that it can feel like such a personal channel — and still scale. And moving beyond the batch-and-blast approach means thinking much harder about the one-to-one experience instead of assuming that one-size-fits-all. 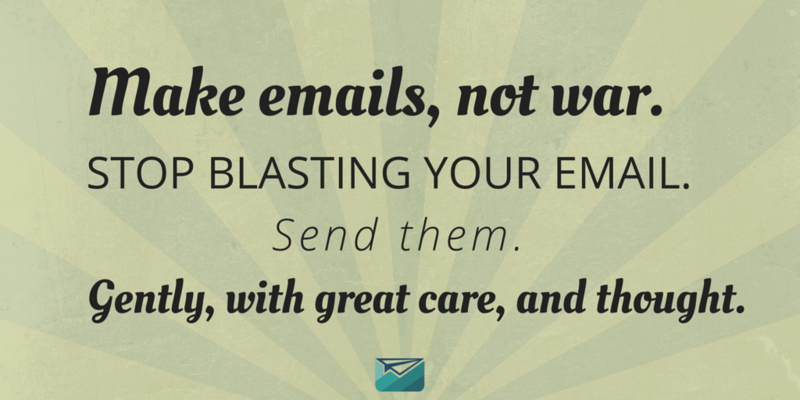 There is no overarching best time to send an email. In other words, the best time to send an email depends on the type of email, individual context, and at a group level, on your audience. Growing your subscribers or new user accounts has to be based around real engagement and permission. Forget about purchased, rented, and third party lists — which make more sense for batch-and-blast tactics. Even thinking about lists as static categories for email addresses is on its way out. Segmentation isn’t something that just happens once. Relevance is much more fluid. Make emails, not war. Stop blasting your email. Send them. Gently, with great care, and thought. There are already so many negative feelings of anxiety, nerves, and annoyance swirling around our voluminous inboxes and thoughtless, outdated marketing approaches. It’s no wonder that the general populace recoils when they think about their email. A bit of care and consideration will go a long way. What’s one of your pet peeves about email marketing? Share with us in the comments!